A new report by Khazanah Research Institute (KRI) provides a comprehensive analysis of the foreign workforce in Malaysia, indicating which industries hire the most foreign workers, which countries they are mostly from, and many more data points. Titled The State of Households 2018: Different Realities, some of the key statistics presented in the report are condensed below. Knowing the foreign workers—where are they from, and what do they do? Foreign workers represent around 15% of all employed persons in Malaysia, which hovers just over the two million mark since 2013. In 2000, almost three-quarters of all foreign workers were Indonesians. Their composition has since diversified – in 2015, Indonesians remain the dominant group (39.2%), followed by Nepalese (23.5%), and Bangladeshis (13.2%). The agriculture and construction sectors hire foreign workers the most, employing 52% of all foreign workers in 2010. 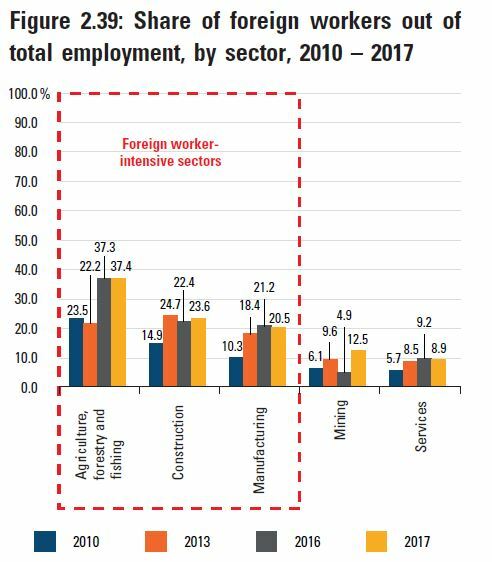 In 2017, these sectors employing 40.5% of all foreign workers, while 35.9% were employed in services while the remaining 23% were in manufacturing. In 2017, around half of all foreign workers were educated up to the primary level. On the other hand, the share of foreign workers with secondary education has increased, from 33.8% in 2010 to 44.3% in 2017. Only 5.6% of all foreign workers had tertiary education in 2017. Low-skilled jobs are dominated by foreign workers. In 2013, 76.7% of low-skilled employed persons were foreign workers, although this has fallen to 51% in 2017. Thus, around one in two unskilled workers are foreign workers, potentially reflecting how foreign workers play a complementary role to local workers, who are mostly in skilled and semi-skilled jobs. However, of all the foreign workers, most tend to be in semi-skilled jobs, that is, 64.5% in 2010, but this share has declined to 52.9% in 2016. Similarly, the share of foreign workers in skilled jobs has also declined. The key takeaway among trends is that at the aggregate level, foreign workers do not occupy the same occupational space as Malaysians. Foreign workers tend to go into low-skilled jobs, where half of all employed persons are of foreign-origin, while native workers go into skilled and semiskilled occupations. While it is true that there is a large increase of foreign workers in semi-skilled jobs, this represents less than 20% of semi-skilled employment. So even as the skills mismatch leaves tertiary educated Malaysians in semi-skilled jobs, on aggregate they do not face a high likelihood of being replaced by foreign workers. Malaysians in low-skilled jobs, on the other hand, could stand to lose. How do foreign workers affect the economy? Firstly, most studies find that foreign workers are imperfect substitutes for native workers. By extension, this means that they do not compete for the same jobs, even within skill levels as certain industries tend to employ more foreign workers. Secondly, immigration can lead to greater economic activity. Following the fact that foreign workers are imperfect substitutes for native workers, it is likely that there are certain economic activities that would not have existed had there been an absence of foreign labour. Furthermore, foreign workers can help firms reduce production costs, thus increase output, and their presence would mean an increase in consumption and demand for goods and services overall. Finally, the presence of foreign workers leads to task specialisation. 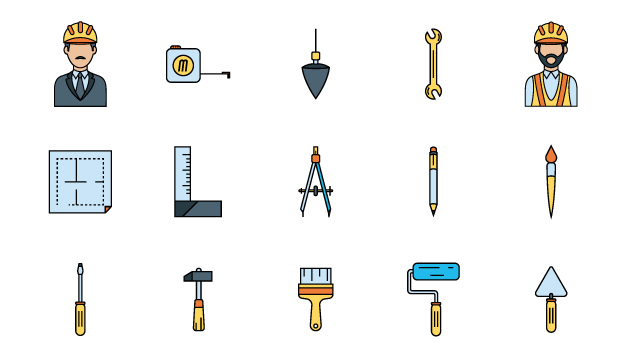 The ability of foreign workers to take up low-skilled jobs creates new opportunities for native workers to be supervisors of these low-skilled workers. An increase in foreign workers leads to small increases in local employment and wages. A 1% increase in foreign workers led to 0.1% increase in full-time employment and 0.3% increase in part-time employment for Malaysians. This effect manifested strongly in the services, agriculture and mining sectors, while there was not much rise in the employment of locals in manufacturing. As for wages, a 10% increase in foreign workers raised the average wage of Malaysians by around 0.15%. This was particularly evident in the agricultural and low-skilled services sectors. The large number of unskilled foreign workers with minimal education fill up jobs that locals are overqualified for. This frees up natives to take on supervisory roles. On the other hand, the least educated, lowest-skilled Malaysians—those who compete directly with foreign workers—were significantly disadvantaged as they experienced job displacement and wage suppression. No statistically significant impact was found in ICT services and accommodation sectors, firm productivity in the smaller construction and plantation establishments were clearly lowered. One possible explanation posited was that foreign workers complement natives better in some sectors than in others. Second, there was a marginal impact on wages, but it was inconclusive whether this impact is positive or negative—some studies showed marginal benefits for locals, while others, focusing only on manufacturing sector, found small negative effects on overall wages. Third, there was a lack of evidence on the impact of immigration on labour productivity. The existing few focused on different components of labour productivity, but it is unclear whether the effect is positive or negative overall. There are many ways to stand out in a job interview but wearing pajamas and slippers instead of a business attire to the meeting w..